When I wake up every trading day, I usually check the business news and its impact on the market outlook. Lately there have been two consistent themes. One, the DOW futures are trading higher. I don’t know the exact number of times over the past year this has been the case, but it must be well over 80% of the time. The second theme is that Bitcoin is trading at another record high. 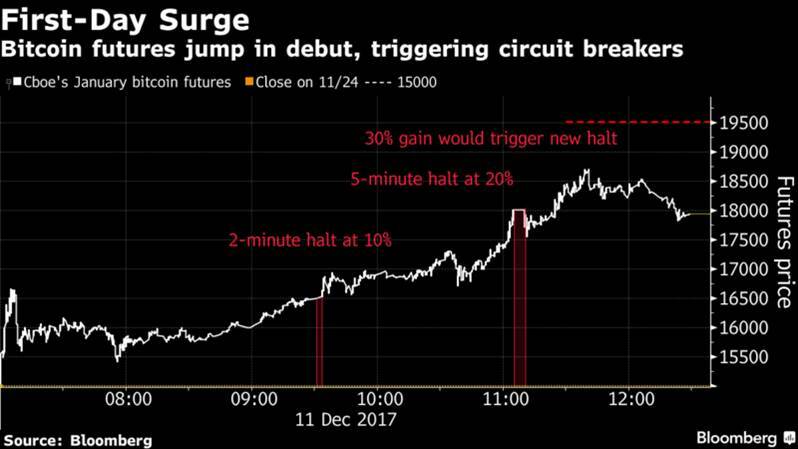 And on December 11th, with the launch of Bitcoin futures contracts on the CME, the price of Bitcoin surged yet again, and the futures traded up to the point that trading needed to be halted. The markets for risky and speculative assets are in a trading frenzy unlike none I have seen in my lifetime. Sure the stock went up rapidly in the 80s after the Reagan tax cuts. But real economic growth in this time frame was 5-8%, and the gains relative to GDP and the falling level of interest rates made the stock valuation moves justified, at least until a breaking point was reached in 1987. The market experienced a similar euphoria in the late 1990s, only to be knocked down after the turn of the century. Again, high rates of real economic growth coincided with the rise, and the advent of lower growth post year 2000 knocked the expectations for stock returns down, and the market fell. The big difference with today’s market and these past experiences is the contrived nature of the market movements. News about the economy means very little in the derivation of what investors should expect as a rate of return going forward. There seems to be a complete disconnect across all markets. Sure corporations publish their profit reports, and the level of earnings and the management outlook provide some degree of input into the process of determining how one stock stacks up against another in a relative valuation. 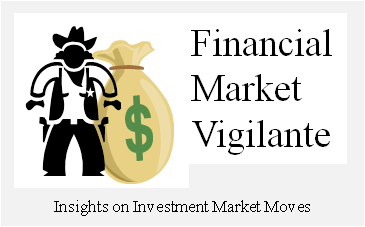 But, the Russell 2000 (IWM) is priced at 24x earnings! And the DJIA (DIA) is up year over year over 30%. High yield companies (HYG) are floating long-term bonds at 4%-5%. And the 10 year Treasury (IEF) is stuck between 2.3% and 2.4% even though the Treasury is in the process of borrowing almost $1 Trillion over a 6 month period. These are return and valuation metrics which might be appropriate in a market rebound after a steep correction and hard recession. But in today’s market, these turbo-charged market returns and valuations are a sign of a more serious problem in the financial markets. And, the Bitcoin craze is leading the charge in making a mockery of the current state of the so-called free market system. And yet, even though the reality that Bitcoin is worthless as drive sector AF033 on a corrupted hard disk drive, it has managed to become a tradable scam in the world financial market. 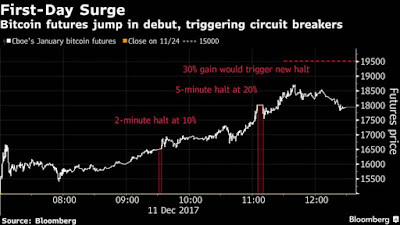 Not only is it traded on [unregulated] exchanges throughout the world, but derivative traders [on regulated exchanges] can now place leveraged bets on the directional change in Bitcoin value. There is a serious problem waiting to happen in the financial markets when this can happen while the whole world watches like it is a sporting event. But, the Bitcoin craze is a symptom, not a root cause of a financial system problem. We currently live in a contrived and convoluted financial system, one where central bankers, aided and abetted by government borrowing largess, throughout the world have unleashed “bits” of “liquid” money into the system while simultaneously withdrawing investment assets from the market and storing it on their balance sheet. In so doing, the bankers have set up a scenario in which they are single-handily destroying the fundamental basis of capitalism, the ability to earn a real rate of return on capital. By pushing interest rates on US Treasuries to zero in the U.S. and holding them there until recently, and moving rates on sovereign notes and bonds below zero in Japan and the ECB, the central banks have created a very cynical public view of how the financial system works. And in the process, they have destroyed trillions of dollars in real market investment. I say destroyed because the incentive has tilted to get rich quick schemes, carry trades, derivative gambles and stock buy-backs rather than real economic investment. The harsh reality, as shown in the Federal Reserve chart below, is that new capital is being put to work on real projects at a historically slow pace since the extraordinary QE measures were started back in 2010. 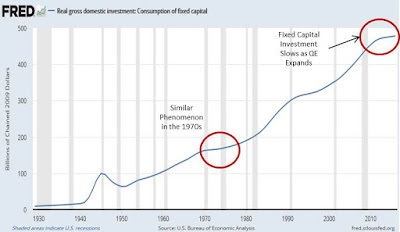 As a result we now have a financial system in which too many “bits” of money, be it USD, Euro, Yen or even Yuan, are now chasing too few investments. 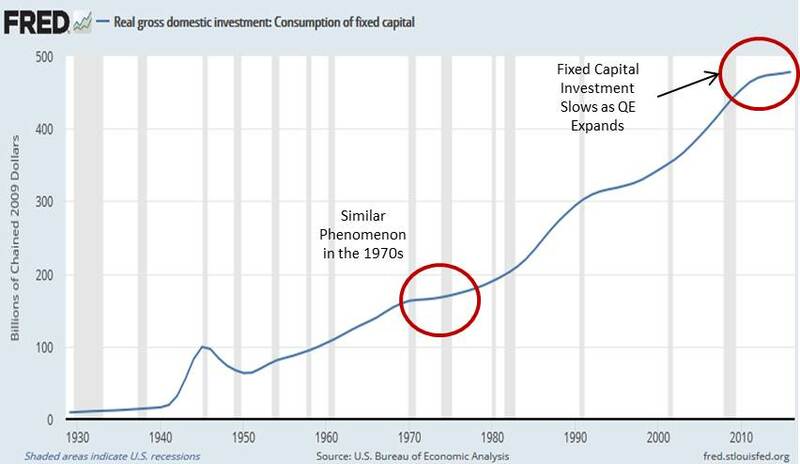 A similar market phenomenon happened back in the 1970s, also a time period when the Fed over-exercised QE in the financial system, destroying fixed investment activity as well as casuing high inflation. This time around government fiscal spending growth constraints have kept CPI measured inflation at a minimum. However, financial asset inflation has sky-rocketed. Today, scams like Bitcoin are taking hold in the financial system. And, we also see entire stock market complexes like the DJIA providing returns an order of magnitude higher than normal for a 2% real growth late cycle economy. The investor mind-set has become, what do I have to lose? Throw a few “bits” at the scam, and see if it will double or triple by next week. Central bankers around the world need only take a good look into a mirror to answer the question why this is happening. I enjoy seeing stocks sky-rocket when they represent growth and opportunity flourishing in the economy. 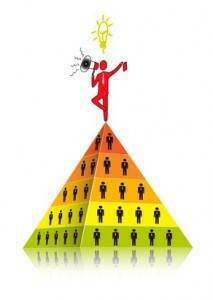 I have made plenty of money by taking risks in this type of financial system. Oddly, I will feel better when Bitcoin comes crashing down, but only if it is accompanied by central bankers learning a very important lesson. Until this happens, Bitcoin will continue to make a mockery of the convoluted capital market system we have in the western world today. Daniel Moore is the author of the book Theory of Financial Relativity. All opinions and analyses shared in this article are expressly his own, and intended for information purposes only and not advice to buy or sell.